Susy was born in Cardigan. She is profoundly Deaf since birth & lip-reads. She was educated at Glanrhyd Primary School & Preseli Comphrehensive Secondary School at Crymych. During this time she won various competitions at swimming & athletics. Susy Soravia 4th Dan Karate Instructor with 26 years experience. 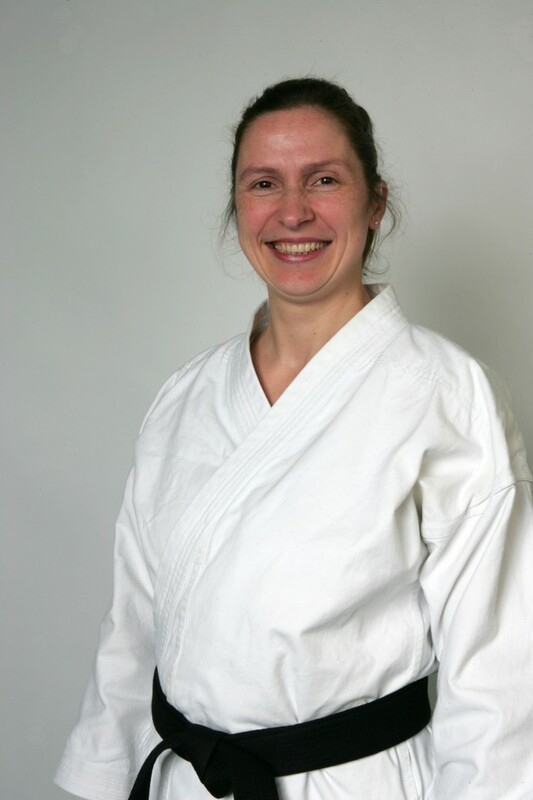 She started Karate in 1989 & previously taught at clubs Pembroke, Narberth, Crymych, Carmarthen, Peniel and Llandybie with Shihan Barbara & the late Keith Mumberson (6th Dan) back in 1991. During her time, she has trained with best Karate Instructors like Sensei Alan Francis 6th Dan, Sensei John Dunn 6th Dan Letterston & Sensei Peter Spanton 9th Dan London. Susy is now Instructor at Pantyffynnon club and Disabled Karate at Tumble. Susy gained her 4th Dan grade on 12th February 2011. She is Level 11 Coach, First Aider, CRB checked, have Child Protection course certificate & is Instructor for the Deaf. She qualified 10.3.14 as Welsh Judge for Welsh Championship at Cardiff. (first ever Deaf Judge in Wales in a hearing competition). She also qualifed as UKCC Coach for Disabled. Susy is an Instructor for the Deaf, previously providing specialist assistance at the Welsh Sports Festival twice in Cardiff. Susy’s outstanding karate history stems back many years & is a former fighter at national and international levels (with 16 gold, 5 silver & 10 bronze under her belt) - She was Brighton Kata Champion (in support for disabled karate), twice Welsh Champion, 5 times Higashi Champion, Wales v Ireland Champion, twice North Wales Champion, 3 times Bushi Kai Champion, 2 gold Disabled Karate Festival, 2nd British Wado Ryu Cup, European International Fighter representing Wales and British Squad under Shihan Ticky Donovan 9th Dan and Squad Trainings with World Champions - Molly Samuels, Janice Francis, Vic Charles and Wayne Otto. April 1998 – She was named Young British Achiever by HRH The Queen & attended Buckingham Palace. 11th May 2011 – Susy took part in a documentary for See Hear Deaf Programme which received 9 million viewers. Sept 2011 – She won the regional Sound Barrier Award for Wales & as a result came top 5 in UK for her inspirational story, receiving a certificate from former Coronation Street star Rula Lenska. Nov 2011 – Sport Wales displayed Susy’s film of her interview and her club on big screen in run up for Olympic Games 2012. This programme was screened at Swansea, Llanelli & Cardiff. 25th Jan 2012 - Susy was runner up at Carmarthenshire Sports Personality of the Year at Stradey Park Hotel. “It’s not about winning medals or awards, for me everyone are the winners!” she said. 27th May 2012 - Susy ran with Olympic torch at Sarnau, north of Cardigan. “I have never been so humbled as I have been on that day with so many people supporting us! This was a real honour & if this inspired the Deaf/Disabled/Hearing people, then this is worth it!” she said. 17th Nov 2012 – Susy was on the stage at UK Deaf Sports Personality of the Year Award evening in Coventry as one of 39 Deaf Torch Bearers of UK as inspiration. 20th Nov 2012 – Susy won CAVS -Volunteer of the Year Award. 5th July 2013 – Susy is a runner up for Grassroots Sports Coach of the Year at Carmarthen Journal Community Award 2013. 10.3.14 – Promoted to National Welsh Judge for Welsh Championship by two World Referees. July 2014 – Susy had been picked as a Volunteer for IPC Athletic Championship at Swansea 2014. She helped out with Paralympics as “Accommodation Champion”. 19th June 16 – Susy qualified for UKCC Coaching Course for Disabled Karate Federation. Oct 17 – Susy shortlisted for award nomination “IamEbolden” as Deaf Inspiration for Wales. Award nomination is due on 13th March 2018. Nov 17 – Susy received two gold medals. One for Judging competition and the other for Deaf Women Kata competition at Stoke Mandeville Ikkaido Championships for Disabled/Deaf. Susy is very honoured to have her photographs centerpiece in Heddlu Dyfed Powys Police HQ corridors of sporting fame & the same was done at her former school at Preseli, Crymych. Susy is now named as one of 2 first ever Torch Bearer for Dyfed Powys is is named under roll of honour on website of UK Police Sports.